The following article was published in The Washington Post, January 23, 2014. Oscar Wilde’s tea-parlor comedy is onstage at the Shakespeare Theatre, and by the time its extended run is over on March 9, actor Anthony Roach will have been eating five blueberry muffin halves a day — or 10 on days with matinees — for eight weeks. “I don’t know if I’ll ever be able to eat a blueberry muffin again after I’m done with this,” he said. 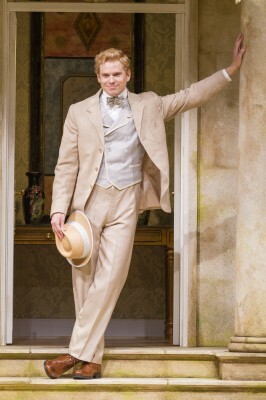 Anthony Roach as Algernon in "The Importance of Being Earnest." Before being cast in “Earnest,” Roach’s tea-drinking consisted of herbal remedies to sooth an occasional sore throat. Now, he knows how to delicately drop in a cube and to always rinse his cup before getting a refill. But even as Roach and his co-star Gregory Wooddell go through the motions of pouring a proper cup, they are stuffing their faces, and that’s a paradox that the actors are playing up in this production. Act I is set in the posh London flat owned by Roach’s well-to-do character Algernon Moncreiff. He’s preparing to host his aunt for tea and orders a tray of cucumber sandwiches especially for her. Then his pal Earnest stops by, and the two men proceed to devour all the finger food before she arrives. He asked the stage crew to add “a bit of lubrication” to the sandwiches, and they did, although he doesn’t know exactly what. One night last week, for some reason, the sandwiches were more brittle than usual. One broke in half and fell to the stage. Like, Algernon believes in the five-second rule. And he really, really likes those cucumber sandwiches. He politely asked the stage manager to never buy sugar-free muffins again. As in Act I, there’s an actual plot point forwarded by the characters’ overindulgence: The two men are fighting over whether Algernon can marry Earnest’s ward, Cecily, but the debate dissolves into a spat over who ate all the muffins, wherein the men holler at each other with their mouths full.